I make homemade jello for my kids at least once a month and give it to them as a snack for school. It’s literally one of the easiest homemade snacks one can make, other than opening up a can of olives or throwing some turkey and pre-packaged guac in a container. But to spice it up for parties I love to make these boats. These boats are fairly easy to make and the kids love them! I do make a suggestion though – find blunt-end toothpicks if serving this to young kids. Otherwise disaster might ensue. This post includes affiliate links. This means I might receive a small amount of compensation if you purchase something through one of the links. All the recipe is is scooped out orange peels, juice, and gelatin. I use the Perfect Supplements Brand of grass-fed gelatin. You can use whatever type of juice you’d like – bottled, freshly squeezed, etc. This way you can control the amount of sugar and additives like food coloring that is used, rather than using the commercial Jell-o boxes which are certainly not Paleo. If you just want to make plain jello without the whole boat thing, my rule of thumb is 1 tbs gelatin to 1 cup of juice. So typically when making it as a snack for my kids I’ll get a big jug of Naked Juice (which is 8 cups), pour it into a large saucepan, then sprinkle 4 tbs of gelatin on top, wait a minute to let it start to soak in, then whisk, then sprinkle the final 4 tbs of gelatin on top, whisk, then heat the juice until the gelatin is completely dissolved, stirring occasionally. Then I pour it all into a 9×13 glass Pyrex dish and refrigerate overnight. In the morning I cut it into squares and off it goes into the kids’ snack containers (and sometimes my mouth). These boats are basically the same, except instead of pouring into a glass dish you would first cut the oranges in half, scrape the oranges out from their peels (so you basically have little orange bowls), place them on the bottom of the pan then pour the jello inside of each orange “bowl” until it reaches the top. After refrigerating for at least 4 hours you can remove the oranges and cut in half. 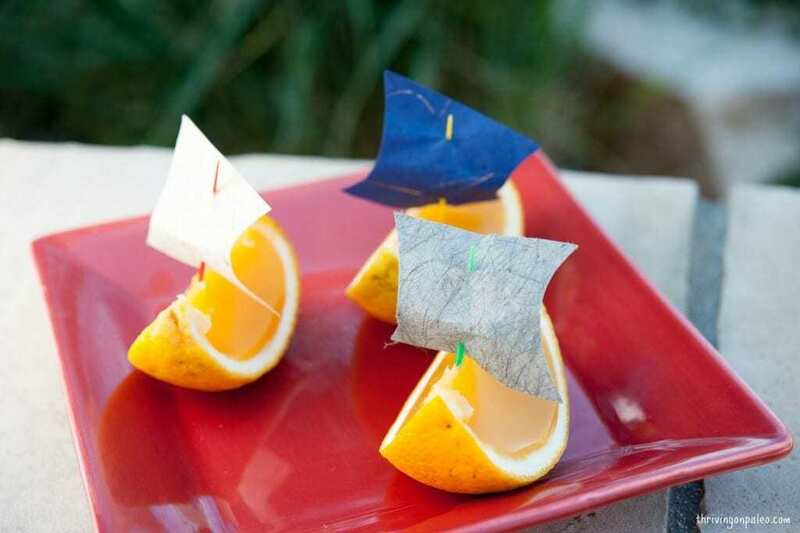 To make the sails, cut sails out of paper and then stick a toothpick through them and place in the jello. And then you have jello boats! If when you make these you wind up with a bit of extra juice that doesn’t fit into the “boats”, just let it set in a separate bowl/container/mold. The kids (and adults) still love the loose jello and it’s great for the really young kids and babies who can’t quite figure out how to eat out of the boat. These homemade jello boats are so much fun – for kids AND adults! Paleo and AIP-compliant. Scoop out the flesh from the oranges so you just have the peels that now look like little bowls. Place the bowls in a glass baking pan. Sprinkle 1 tbs of gelatin per 1 cup of juice over the juice and the whisk. Heat the juice until it is hot to the touch and the gelatin is dissolved. Pour the juice into each orange “bowl” until it reaches the top. Put the oranges into the refrigerator to set, at least 4 hours, preferably overnight. Once set, cut the oranges in half to make the boats. Cut out sails from paper and then push a toothpick through the sail and into the jello. Sooooo cute!! Love this idea!